I called Rita a few weeks ago letting her know that I was coming with another cat food donation for her colony cats and indoor cats. Rita told me she was concerned that one of her colony cats was injured and had blood on her hind legs. She said she has been calling other rescue organizations for help but no one could come. I brought a trap during her colony feeding time and saw Princess right away. Yes, she clearly had blood all over her hind legs. It was impossible to tell what happened or speculate. Princess was limping, but still mobile. I set the trap and waited for awhile to no avail because Rita still had fed them anyways. I left the trap with Rita and told her to call me as soon as she got Princess. Rita called me several days later and said she had coaxed Princess into her house. For some reason Rita waited a few days to call me with this news. At this point I was out of town again for work. My friend Erica was trapping another injured colony cat that we were vetting and I asked her to also get Rita’s cat if possible. In the meantime I told Rita to set up her cat carrier with a blanket and treats in a separate room for Princess to become comfortable with the carrier and create a safe place for her. Rita did not do those things. When Erica showed up she had a hard time finding Princess in Rita’s apartment. She and her friend moved the furniture in the entire place looking for Princess. Rita was hysterical the whole time. Erica had to calm Rita while trying to get Princess. They finally found Princess hiding in a Rubbermaid cat shelter in the apartment. They lined the trap up to the shelter and somehow Princess went in. 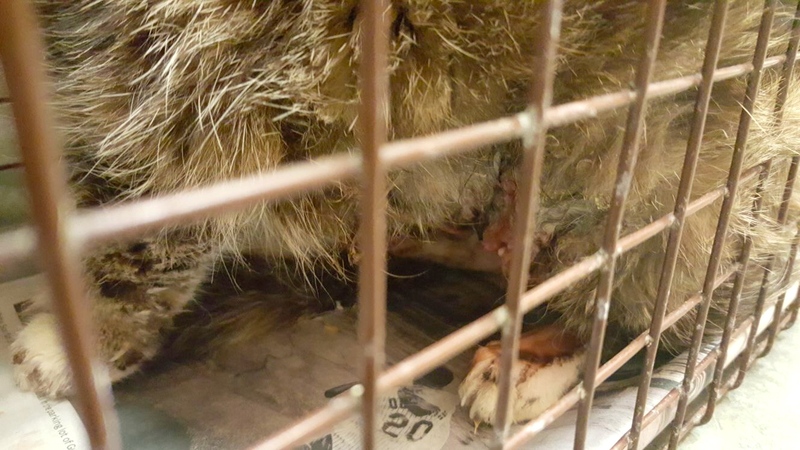 Erica rushed her to our amazing vets at Elmhurst Animal Care Center because she could see something was very, very wrong with Princess’s stomach. It almost looked like her insides were coming out. Warning, the following photos are graphic. The vet quickly determined that Princess had mammary cancer. The tumors were so infected and far gone that they had burst. That is the blood and fluids we saw leaking down on Princess’ legs. She was limping because she also had extreme muscle deterioration. We cannot imagine how long and how much she must have suffered with this. After this quick exam the vet recommended immediately euthanizing her. It was the only humane option. I want to thank our vets for their expertise and compassion. A huge thank you to Erica for being able to trap Princess sooner than I could get there, and for dealing with such a hard situation in Rita’s house. 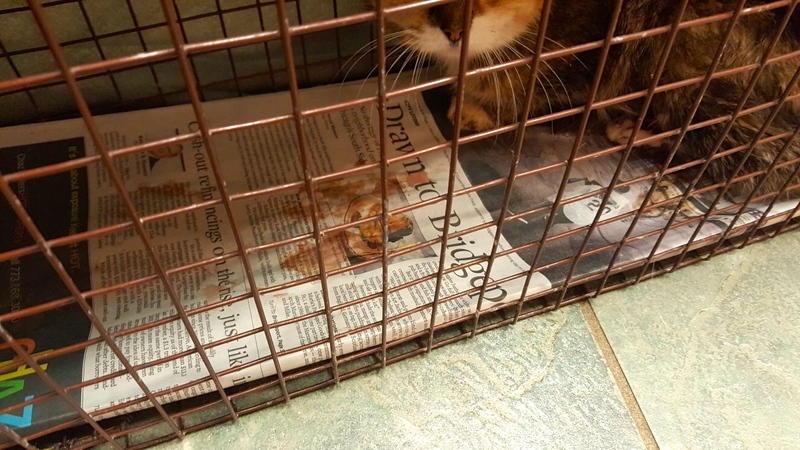 Most of the time during animal rescue there is also a very real, very human component that is part of the story, as much as we try to focus on the cats. At the same time, I’d like to thank Rita for getting Princess into her house. I think cats know when they are in trouble, and this was Princess’ way of accepting help. 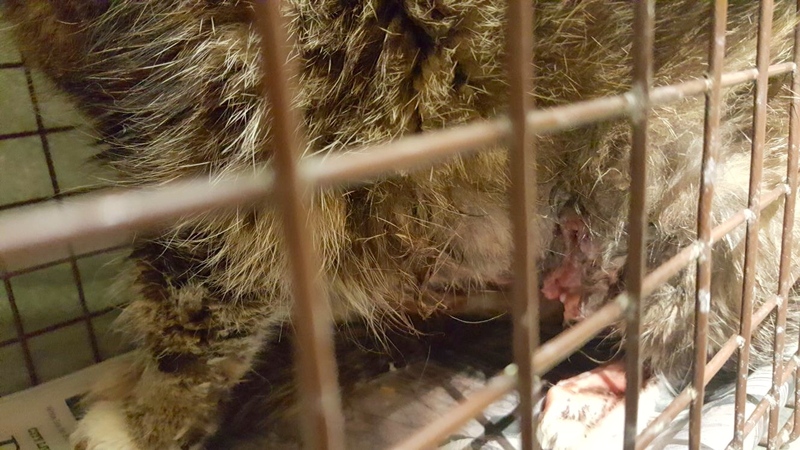 Many times feral cats come to us in different ways when they are sick or injured. I do know Princes had a few good years after her TNR before getting sick like this. 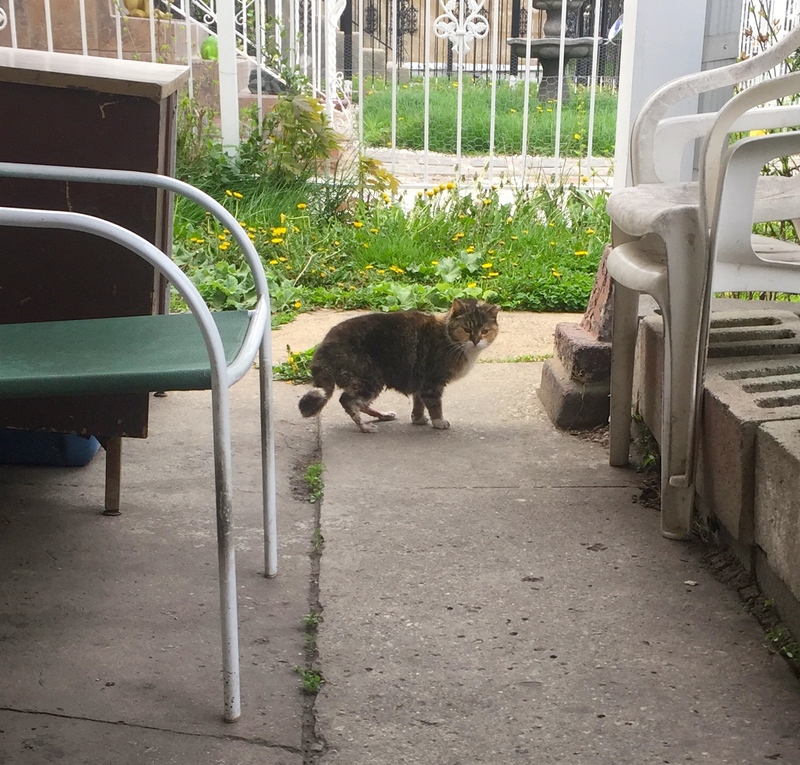 She and her other three colony cat friends were bonded and ate every morning at Rita’s front door, with shelters to hide in under her front porch. In fact, Rita said one of the cats kept looking in her window the whole time Princess was in her apartment. I wish we could have gotten to Princess sooner had we known, but I’m glad her end was humane and in a safe environment, rather than dying alone on the street.